নিচের প্রোগ্রামটি দেখে বলো তো আউটপুট কী হবে? এটির আউটপুট হবে yes। এখন num-এর মান 50 করে দাও। আউটপুট কী হবে? sir, after 3.9 "মডুলাস অপারেটর ব্যবহার না করে ভাগশেষ বের করতে পারবে? 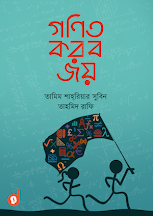 একবার করে গুণ, ভাগ ও বিয়োগ (*, /, -) ব্যবহার করে কিন্তু কাজটি করা যায়।" please kindly tell something more about the line, i cant understand it fully what to do. স্যার, আমি ৩.৯ সমস্যাটিতে মডুলাস অপারেটর ব্যবহার না করে শুধু ভাগ আর গুন করে কাজটা করেছি বিয়োগ করিনাই, মানে আমার বিয়োগ করা লাগে নাই। তাহলে কি কাজটা হবে স্যার ? শামির মোন্তাজিদ, আপনি মডুলাস এর সমস্যা টা সমাধান করেছেন বুঝলাম। কিন্তু এই কোড টা লিখে দেয়ার মানে কি? Ashik Ahmed why did u used scanf for the 'SYMBEL'(line 11,12 of your program) two times?? and Tamim bhaia do u have any suggestion why it does not work when used once only?? i'm new, and the book is helping me.thanks bhaia. The problem is, when you press enter, the newline character ('\n') goes as the input to the first character. That's why we need another one. Good work. But the result is undefined, not infinity. my c program is not worked.so what can i do? I tried to combined some of my programs... & it's not possible to post here.. it's over 4096 letters.. Sorry for making this program likes a SMS. But I did it so that I can be posted. 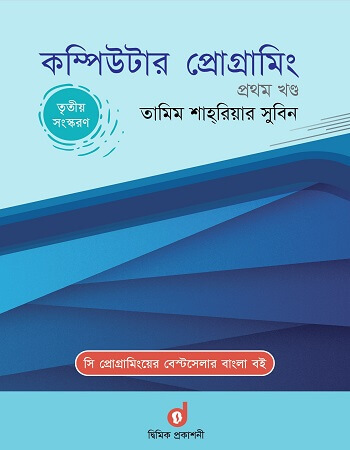 You can find a pdf book link in the facbook page of this book. Just search through the old posts. Btw, it's not recommended to read the book while stuck in traffic jam, as it's not a story book. Read only when you can concentrate 100%. Vaia, what's the wrong in this program? You didn't use scanf() properly in this program. Thanks a lot, got the problem and made the solution. By the way you have done a great job for us (beginners). what you say? Is this okay with it? Whats the problem in the program vaia? Why scanf for sym is written two times in the program? To understand why scanf for sym is written twice, you can do an experiment. Change the part of the code so that instead of sym, you use sym1 and sym2. Then you will understand, I hope. স্যার আমার laptop এর windows 7 এ Turbo C সাপোট করছে না............. এখন কি করা যাই???? vaia....ei jinish solve hoy na kano? Sir, if I give input 12 for semester and 3.2 for CGPA, the output is Invaild. But according to the 3rd condition, the output would be Valid. what is the wrong of this program? please explain. yes I have made it, using the multiply, division and addition I find out the Even and Odd number. ৩.১২ প্রোগ্রামে 'no' কখন আসবে? if 3 is an odd number then how could 30 be even number? Can you tell me the definition of odd and even numbers? where is the problem? if i enter aBC, it show me , you have entered a, a is lower case !!!!! It shows that 'the number is odd' which is not true.Why is it happening? মডুলাস অপারেটর ব্যবহার না করে ভাগশেষ বের করে ফেলেছি সুবিন ভাইয়া...দয়া করে বল কোড কি ঠিক আছে ?